I'm currently working on major improvements in the function and feel of the win probability graphs. For those who have been checking in on the NCAA tournament win probs, you may have noticed a "2.0 Beta" link last night. The new graphs not only look a lot better, but also have added features such as hovering transparent tooltip boxes for game scores and time remaining, and crosshairs for precise win probs at each point in the game. The scoreboard for each game is now integrated with the graph, but it's still a work in progress. The color scheme is still in flux as well. (I'm going for the wood of the court and the dark orange of a basketball. My banner will need to change to match.) I'd appreciate any suggestions you might have for the layout or colors, etc. This will also give you an idea of what the football site will look like this fall. But the football version will be even better, with play-by-play available at each point on the graph, plus added stats such as 1st down probability, expected points, and scoring probabilities for the current drive. But you might not have to wait until fall. Part of my plan this year is to build WP graphs for every NFL game since 2000. The upgrade is thanks to a suggestion by Ken Roberts of the great site "Sports Club Stats." He pointed me toward a very handy web graphing tool. His site probably deserves its own post, but I'll plug it now anyway. Sports Club Stats does playoff projections for most pro leagues and graphs them from the start to end of the season. Just as a win probability graph tells the story of a game, Ken's graphs tell the story of a season. For example, check out the heartbreaking Bucs' or Redskins' graphs for last season. In its simplest form, play calling in football is a game of two strategy choices--pass or run. Game theory teaches us that the mix between the two strategies needs to be unpredictable to be effective. Ideally, there should be an optimum ratio of running and passing based on the expected benefits and risks in any given situation. In this post, I'll examine the effect of predictability by comparing passing success when passes are most and least predictable. In reality there are several different variations of runs and passes an offense can choose. And defenses don't have discrete strategy choices at all. They can select from a continuous range of strategy bias from run certainty to pass certainty. But for now, I'll limit my discussion to just the two most basic options. Consider the graph below from an earlier post on game theory in football. The horizontal axis of the graph represents a range of strategy choices for an offense. On the left is "always run," and on the right is "always pass." Between each extreme is a range of mixed strategies. Halfway between would be a balanced 50/50 run-pass mix. The colored lines represent the utility to the offense of each of its strategy mixes when the defense chooses each of its own strategies. In this example, if the offense were to always run (left edge of the chart) and the defense always played a pass defense(red), the offense would be very successful. And if the defense always played run defense (blue), the offense would certainly suffer. Usually, the strategy mixes settle at an equilibrium. In the example above, the best the offense can do is a mixed strategy of running 63% of the time and passing 37% of the time. In this situation the defense should never blitz because the utility to the offense at the 63/37 mix is higher against a blitz than either other defensive strategy. Keep in mind that yards do not equate with utility. Utility in football is ultimately win probability. The outcome of every play either increases or decreases a team's chances of winning. There are other considerations beyond yardage gained. For example, a 3 yard gain on 2nd and 2 may be better (higher utility) than a 4 yard gain on 2nd and 6. The risk of a turnover also has to be considered. But again, the analysis is always dependent on the situation and always assumes unpredictability. The benefit of the optimum strategy mix is lost if an offense repeatedly calls run-run-pass all game. What I really want to do is replace that example graph with a real one, based on real numbers. That might be something very useful. We could know truly optimum play calling mixes, or how to capitalize on opponent non-optimization. In a way, we could solve the 'game within a game' of play calling. This is a Quixotic task, I realize. In fact, it sounds quite kooky. But we could narrow the focus enough and eventually begin to get some idea of what the utility graph looks like in certain situations. What we'd really need to do is nail down some of the critical values in the graph, such the endpoints of the utility lines at 100% run or 100% pass, or where the equilibrium point is. I decided to look at "10 yards to go" situations--1st and 10, 2nd and 10, and 3rd and 10 plays. When is passing least predictable? On 1st down. When is it most predictable? On 3rd and long. Fortunately, I think I've solved this problem. I'll explain it in the second part of this article. Don't be caught watching the games on your computer at work. Watch the WP graphs instead. You're supposed to be looking at things like graphs anyway! The Fantasy Football Librarian ranks the purveyors of 2008 fantasy football projections. One thing I noticed is that no one set of rankings appeared consistently near the top of the lists for the various positions. This tells me that none of these services really know anything more than the others. It's almost certainly dominated by luck. What I'd look for is a projection system to consistently rank above-average (not necessarily #1 or near #1) in multiple positions and in multiple years. Then I'd believe that someone actually knows anything about projecting fantasy performance. I'll have more to say about this in the near future. Cold Hard Football Facts trumpets the success of its Defensive Hog Index, which is a compilation of defensive line-related stats. If you missed it, a few weeks ago Michael Lewis wrote a great article about advanced basketball stats. Here's Phil Birnbaum's take. Here's The Numbers Guy's take. Here's another post from Numbers Guy Carl Bialik discussing the plus/minus player statistic used in basketball and hockey. Here is Dave Berri's take. Plus/minus is a form of the "With Or Without You" (WOWY) type of stat. Could plus/minus be useful in measuring individual player value? Probably not directly, but some form of WOWY might be interesting. It's tricky, though. Consider platooning RBs. They probably specialize in different situations, so a WOWY would need to account for that. Pro-Football-Reference.com has put together a series on all-time rankings of wide receivers. They also have a thought-provoking article on penalty types. Football Outsiders has a couple articles worth reading. The first is a quick study on how combine studs rarely pan out as NFL players. The second is an article measuring how bad each team was hurt by injuries. Smart Football has a mathematical explanation of why aggressive, risky gameplans are good for underdogs and conservative gameplans are better for favorites. This post from Tom Tango made me think about the escalating athlete salaries. I don't begrudge anyone making as much money as he can, but there's something going on here that doesn't get a lot of attention. Most stadiums and arenas are built with public tax dollars, and even the privately built ones are built with very heavy subsidies and tax breaks. Teams then lease these facilities for zero dollars or fractions of what they would pay in the open market. Team owners are able to do this because of the not so thinly veiled threat of moving to another city. So the operating expenses of these teams are millions and millions of dollars less than they otherwise should be. Money is always fungible, but I would suspect that most of this money is freed to be used in team payroll. If cities weren't giving billion dollar stadiums to teams for free, the teams wouldn't have $25 million/year lying around to pay someone to swat at a ball with a stick. Star athletes would be willing to play for far less. Alex Rodriguez would be perfectly willing to play baseball for $100,000/year if he had no better offers. What else would he do, be a personal trainer? The other $24,900,000 is what's known as "economic rent." So if you're troubled by skyrocketing athlete salaries, look no further than your city council or state legislature. Kotite's Corner suggests a new QB rating system that considers essentially the same things as the NFL's but adds rushing, and improves the weighting by using how well each stat correlates with winning. Jason Winter of Defensive Indifference has his own passer rating system. 'Delta Whiskey' takes a very thorough look at the RB overuse issue. Dennis O'Regan looks at home field advantage in NFL divisional games. In the last post, I discussed how the Poisson distribution can model scoring in hockey (and other sports such as soccer and lacrosse). I looked at how we can estimate a team's "true" expected winning percentage based on their average goals scored and allowed. In this post, I'll illustrate how the same method can estimate the probability of which team will win a particular game. I'll also calculate the probability of which team would win a best-of-7 series. The Bruins are clearly the better of the two teams. Their goal distribution is skewed higher than their goals allowed. The Caps' distributions are closer together. The average goals per game in the NHL is 2.8. When the Caps' 3.1 G/gm offense goes up against the Bruin's 2.2 G/gm defense, we could expect the Caps to score 2.5 G/gm. I look at it this way: 2.2 G/gm is 0.6 G/gm less than average for a defense. The Caps would therefore score 0.6 G/gm less than they usually do. Like I did in the last post, we can add up the probabilities of each possible goal combination. All of the permutations in which the Bruins win add up to 54.7%, and all the permutations in which the Capitals win add up to 29.2%. They'd tie in about 16% of the games, so if we split those games evenly, we get a 62.7% chance that the Bruins would win. But this doesn't account for home ice advantage (HIA). In the NHL, the team with home ice wins about 55.4% of the time. Using a logistic adjustment (that is described in detail here), we can translate HIA into a logit value of 0.094. The Bruins' 62.7% win probability translates into a logit value of 0.520. Add them together if the game is at Boston, subtract the HIA logit from the game probability logit if the game is at Washington. Assuming the game is at Washington, we get a net logit of 0.426, which translates into a win probability of 62.7% for the Bruins. If the game were at Boston, it would be a 64.9% win probability for the Bruins. At this point in the NHL season, the top playoff spots are already claimed. So many fans are more interested in how a best-of-7 playoff series would turn out. Given the Poisson model game probabilities, the Bruins would have a 76.1% chance of winning a playoff series vs. the Capitals. Rather than post NHL game probabilities and series probabilities for the next few months (I'm not that interested in hockey), I've made my Excel spreadsheet available for anyone who's interested. I made a handy little interface with 2 drop down menus to select which teams you're interested in. It will calculate team expected winning percentages, game probabilities, and series probabilities. Note that this model does not consider the end of game situations in which a trailing team pulls its goalie in favor of an additional skater. I would suspect this causes a slight amplification of goals scored for good teams, and goals allowed for poor teams. It would make ties slightly more likely than the model would expect, and it would make 2-goal victories slightly more common and 1-goal victories slightly less common than expected. I'll repeat my disclaimer from part 1 of this post. I doubt much of what I've done here is original at all. In fact, in the past couple days I found a few hockey stats sites which I'm certain cover Poisson modeling and much more. There's a lot to be learned about what makes football unique from other sports. I recently built a live win probability model for NCAA basketball, and now I've started looking at NHL hockey. Instead of doing the same kind of win probability modeling, which would nevertheless be interesting, I thought I'd take a completely different approach. Let's say you have a hockey team that scores 3 goals per 60 minute game. How likely are they to score exactly 3 goals? 2 goals? 4? The Poisson distribution can tell us. Pr = xk e-x / k! Hockey is an example of a fluid sport, and it's ideal for Poisson analysis. The clock rarely stops and control of the puck goes back and forth between teams often, and much of the time it's not even clear if either team has control. Goals are relatively rare, and are approximately equally likely to occur at all moments throughout a game. Soccer and lacrosse are also examples of this type of sport. This season NHL teams score an average of 2.8 goals per 60 minutes. To calculate the probability of a team scoring exactly 3 goals in a game, the Poisson distribution tells us it's 0.22. The probability of a shutout, zero goals, is 0.06. We can go further and apply this to specific teams. 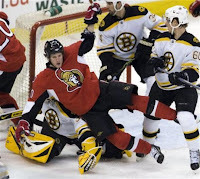 For example, the Boston Bruins, which are currently the NHL's top team, score 3.3 goals/game and allow 2.2 goals/game. Their distribution of goals scored and allowed for a single game are plotted below. As you can see, the higher goal amounts are obviously going to be more common for goals scored than allowed. How is this useful? We can calculate the Bruins' expected winning percentage by summing the probabilities of all the possible combinations of outcomes--1 to 0, 2 to 0, 2 to 1,...The cumulative probability of all outcomes in which the Bruins outscore their opponents reveals an expected win%, similar to the Pythagorean expectation developed originally for baseball. Using this method, the Bruins can be expected to win 60.0% of the time outright. In 15.8% of games, they can be expected to be tied at the end of regulation. Overtime in hockey is a single 5 minute sudden death period followed by a shoot out if necessary. OT outcomes are far more random than the rest of the game because it's not who scores the most; it's who scores first. Besides, a tied game in regulation suggests the teams are relatively evenly matched, at least on that day. So for now, let's say the Bruins will win half of their OT games. They should be a .679 team, and in fact, they're currentlly at .642. We might say, if anything, they're a little better than their record indicates. In part 2, I'll describe a method for estimating game probabilities for particular team match-ups. But before I sign off, I want to be clear that I doubt anything I've done here is original. I know for a fact that hockey analytics guys use Poisson modeling extensively. And I doubt this has much relevance to football. In fact, that's the point. It's unlikely that there's much about football that is Poisson, and that's worth understanding (if true). Besides, I like to investigate what make various sports unique. 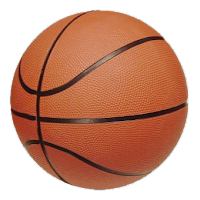 Live win probabilities for NCAA basketball games are now available at wp.advancednflstats.com/bball. The model's approach is very similar to my football model. Basketball is a much simpler sport, though. There's no field position, down, or distance in basketball. Score and time remaining are really the only significant factors. When the NFL season ended, I still had a framework for real-time win probability graphs. All I needed to change was the data and model behind it. In fact, I could pretty easily do it for other sports such as the NBA, NHL, or even MLS. I'm not planning on launching AdvancedBballStats.com or anything. This is all just for grins. I've written up some details on the model at a guest post over at Dave Berri's Wages of Wins site. Comments and suggestions are always appreciated.